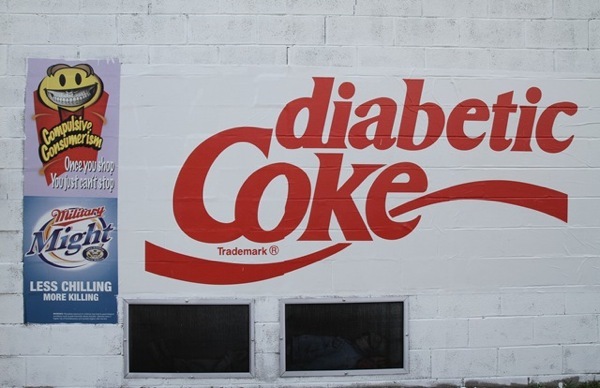 The environmentalist blog TreeHugger recently posted a list of their top 5 “environmental artists.” Props to TreeHugger for putting Banksy at number 5 and then John Fekner at number 3. They put together a nice slideshow of some of their favorite work from Fekner, something I’ll eventually do here as well. Back in July (and actually again in August), I had the pleasure of visiting the studio that John Fekner and Don Leicht share. 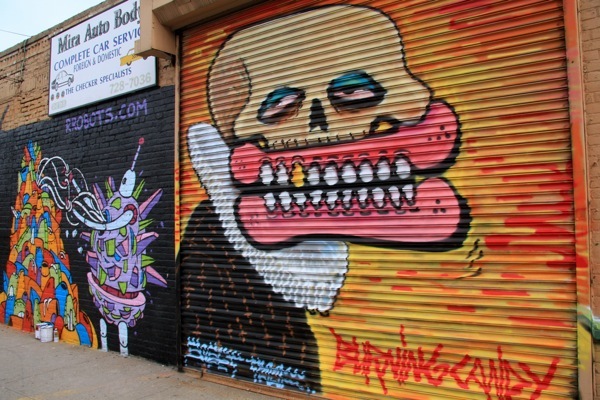 John and Don are two artists from one of the earliest generations of street art. 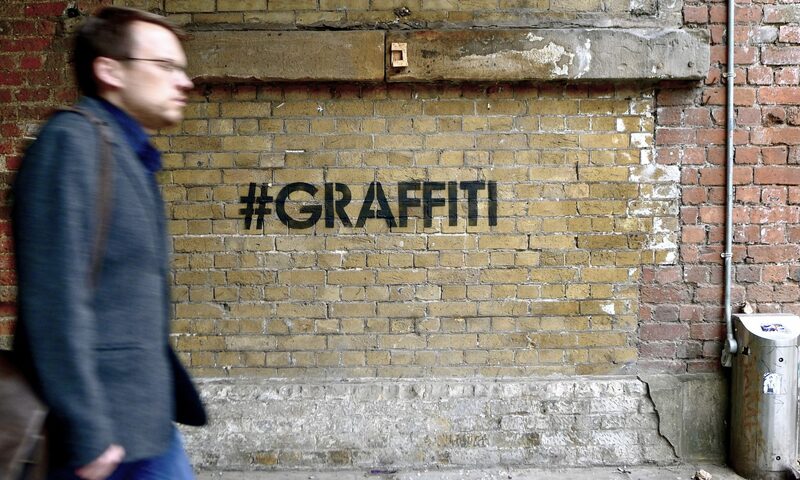 John made his first piece of street art in the late 1960’s, and really got involved in the late 1970’s as one of the pioneers of text art and stencil art. 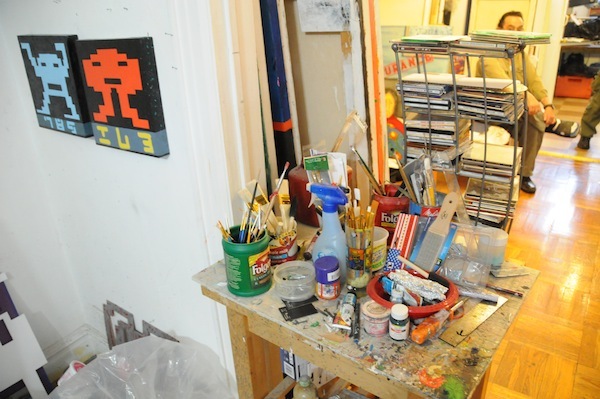 Don is probably best-known as the original space invader. 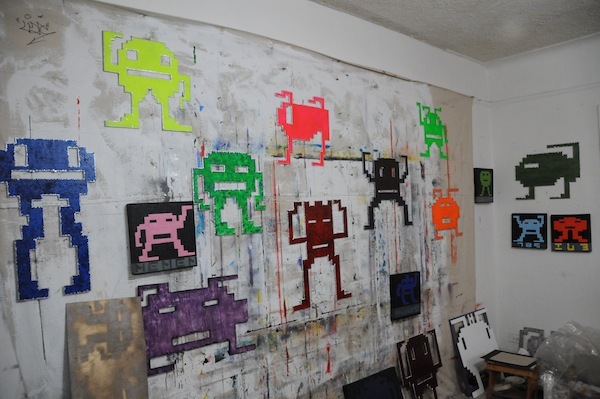 In the early 1980’s, Don was spray painting stenciled space invader characters around New York City and making space invader sculptures. For me, the best part of visiting the studio is that Don and John still own what is perhaps their most important and powerful indoor work. Your Space Has Been Invaded. Our Children are Fighting a Terrible War. 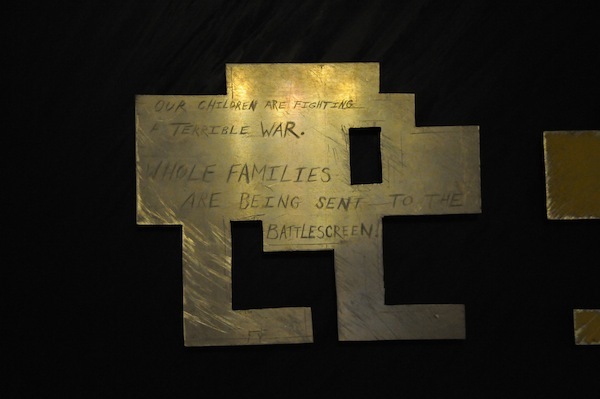 Whole Families are being led to the Battlescreen was made in 1982, and it takes pride of place in the studio. With this artwork, the duo actually predicted something that has since become very true: Soldiers are being trained by video games (although the effectiveness of that training may be in doubt). I feel like an idiot for not getting a detailed shot of the wooden and metal space invaders on this wall. 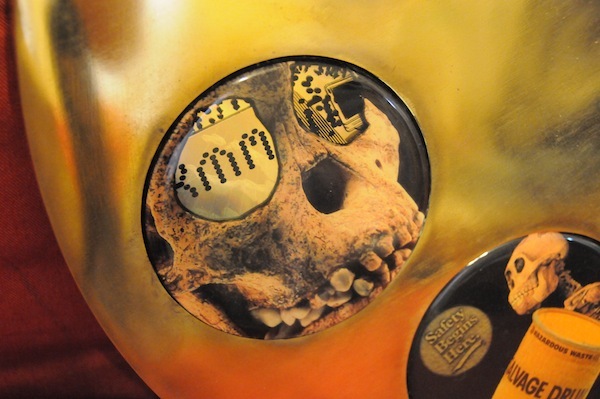 Don’s invader sculptures have some beautiful details. 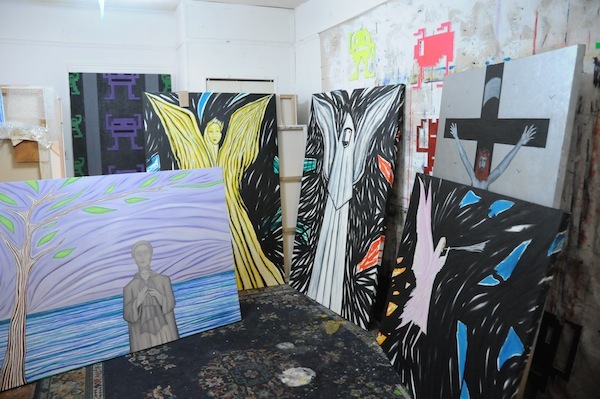 Many of their paintings are on a pretty large scale; there are probably a few stacks of these canvases (mostly by Don, a few collaborations) 10 deep around the studio. John told a funny story about the above piece. 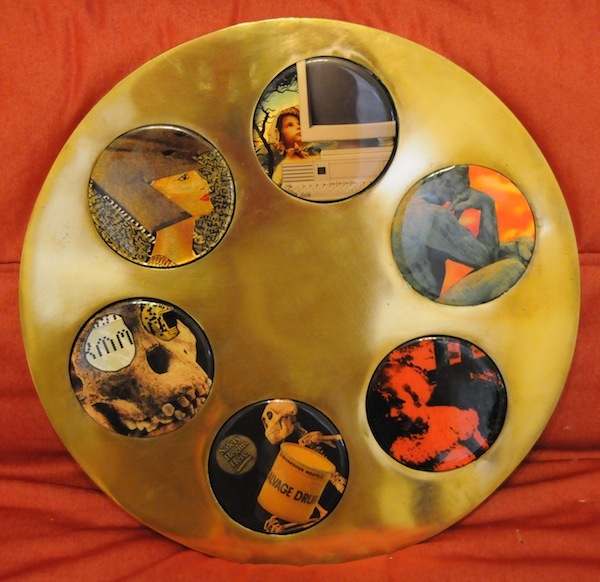 At one point, he was putting up stencils that said things like NY+DK or DK, so when DKNY was launched, friends called to ask if John had started a fashion line! 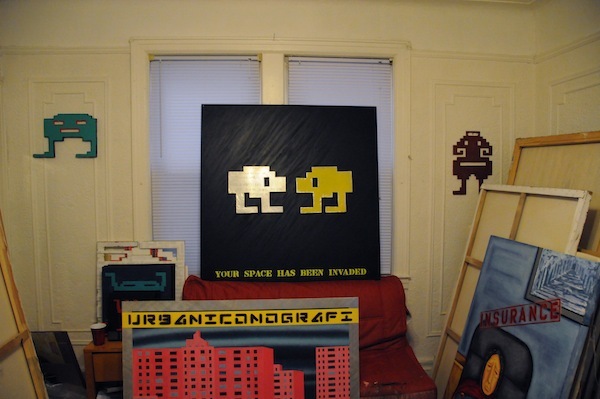 These little Pac Man ghosts were some of my favorite pieces in the studio. 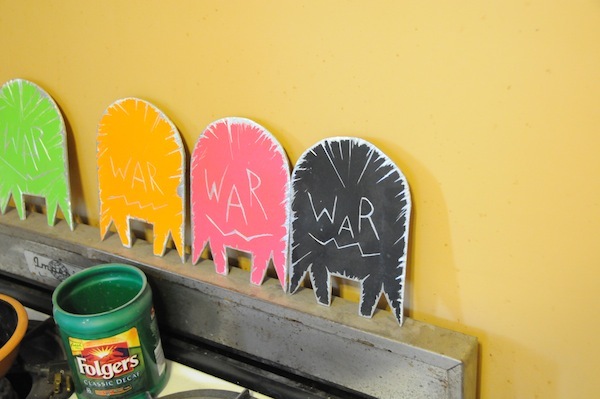 At first they look like cute little characters, but then you realize that the word “WAR” is written on them all, and the reality of the art sinks in. 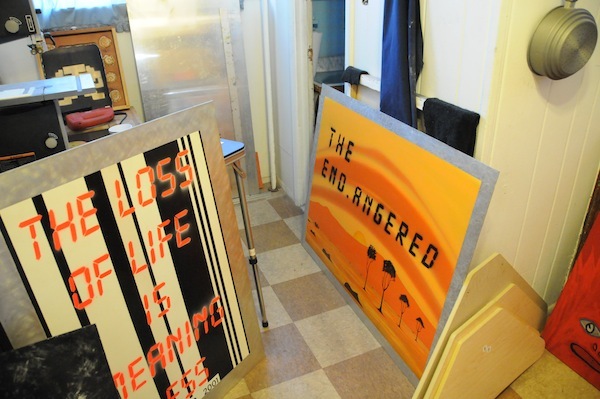 The painting on the left says "The Loss of Life is Meaning Less"
The Techno Plaques are collages made of CDs. 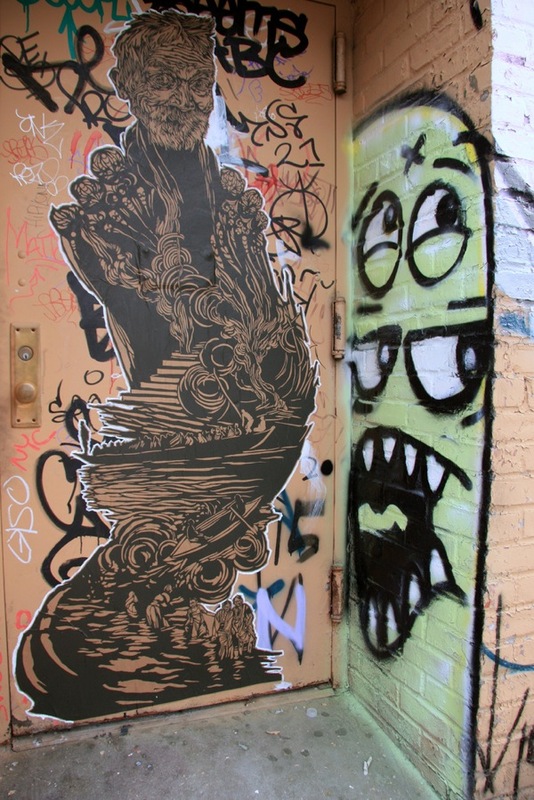 The studio visit was a really amazing experience, but John’s place in art history comes from his street art. At some point, I’m sure I’ll do a post here with a “best-of” selection from John’s amazing career, but for now, you can check out his website. After seeing the studio, John actually took me to see some of his street art. 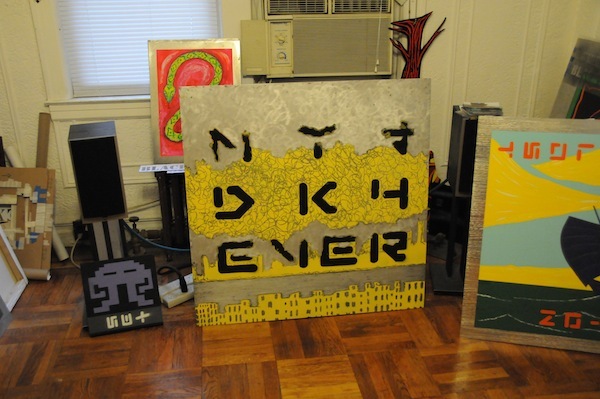 Throughout his art career, John has been painting at a park in New York that he has nicknamed Itchycoo Park. 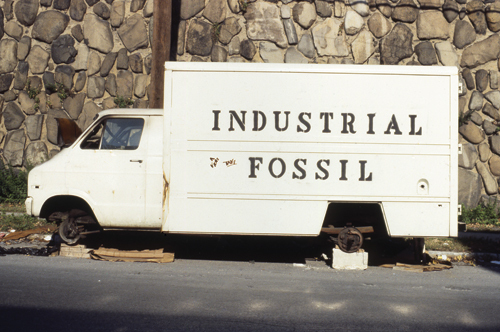 It was the site of his earliest street art and he curated an outdoor show there in 1978 with artist like Gordon Matta-Clark. I wanted to see one of the birthplaces of street art, so I was excited to visit the park, but John surprised me when we arrived by showing me some of his more recent stencils at the site! 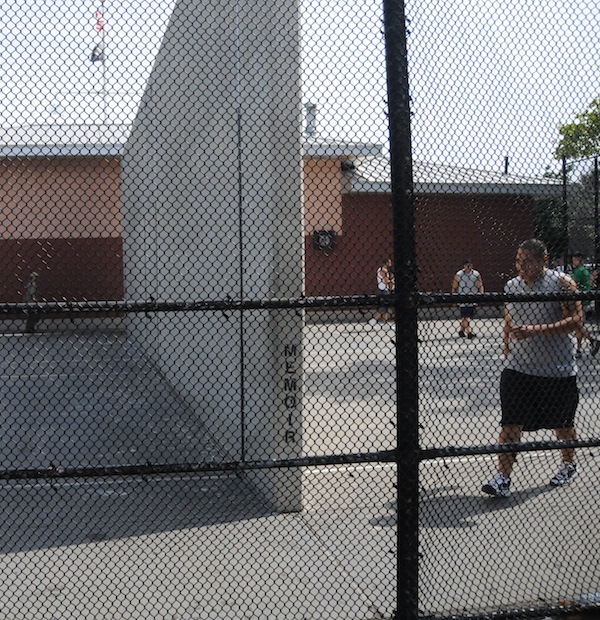 Back in 1983, John painted the word “Memory” on a handball court at the same site, now he’s come back to reflect. I cannot thank Don Leicht and John Fekner enough for the opportunity to see their studio. They are two of the original street artists, and with street art reaching such popularity these days, it’s important to not forget where it started. 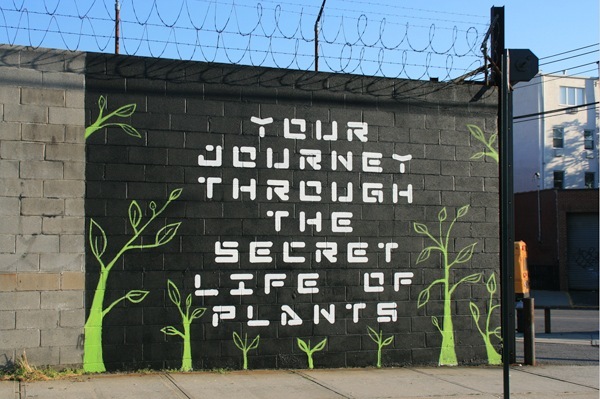 A few days ago, Gaia wrote about Ad Hoc Art’s Welling Court Mural Project. Here’s a quick update with more of the finished artwork. Becki Fuller and Luna Park have a bunch more photos of the event over at their blog, The Street Spot.